The Knoxville craft beer scene continues to expand. There were several recent events I thought I’d write about, as well as some ones on the horizon. The first thing I want to talk about is the Fix The Beer Tax movement in the state of Tennessee. Instead of myself going too deeply into explaining it, I’ll refer you the official website to learn more about this important issue. Please read about it and get involved by clicking on the contact your legislator link. On February 15th, there was a Fix The Beer Tax rally at Barley’s in Knoxville. This gathering of craft beer enthusiast heard from various representatives of the beer industry and from sponsors of the bill. I was there along with many of my fellow craft beer lovers. I took a few pictures and a short video as well. Here is a video of Knox Beer Snob Rob talking about the issue. WBIR channel 10 was there to report. Check their story and video HERE. Another great video from WBIR featuring my buddy Erich Allen from Studio Brew. Another recent event I was lucky enough to attend was Eagle Distributing‘s second Gettin’ Crafty. This is an industry event for retail beer sellers, bar owners, staff, local brewers and bloggers. The purpose is mainly to get familiar with existing and new brands that are distributed by eagle in the Knoxville Market. I had previously written about the first Gettin’ Crafty with Eagle back in August. This is a great time with food, beer, friends and some freaking cool door prizes at the end. I want once again thank Jeremy Walker for the invite. I do want to mention that when I wrote about the first getting crafty event I did take some digs at Cherokee Distribution for their widely perceived indifference to craft beer. They have gotten a little bit better and have finally hired a craft beer manager. I am hoping that they take Eagle’s lead and put on a similar event. It would go a long way to improving their image in Knoxville. Anyway, here are some pictures of the event. 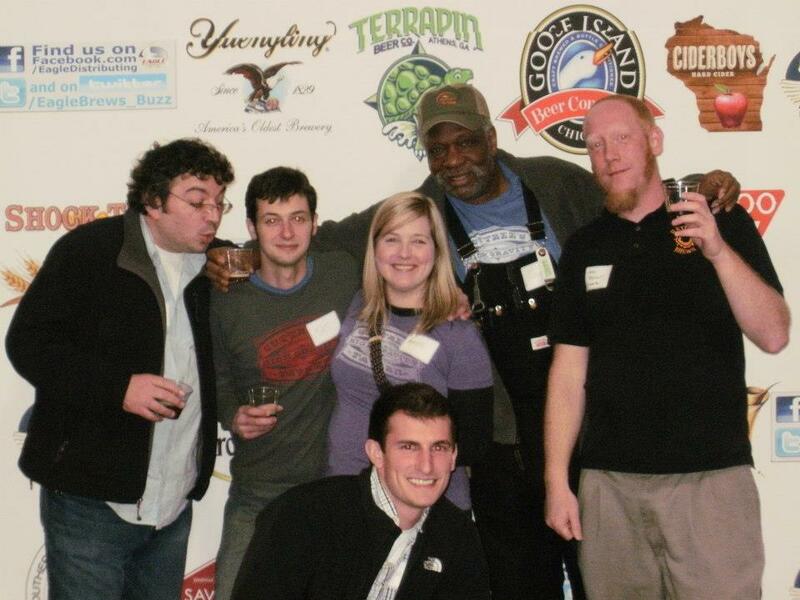 The Suttree’s crew: Stanton, Matt, Anne, Dupree, Myself and Kevon. I LOVE me some Sam Smith! The Sam Smith table. Sam Smith was my 1st craft beer love. I was lucky enough to be given that bar mat at the end of the night. Look, It’s Beer Snob Rob! Dave Ohmer, head brewer of Saw Works and all around cool guy. Jeremy Walker talking with Steve from Terrapin. and we appreciate you, Eagle. I don’t know who brews there ciders, but I enjoyed them. Who wants to win this? Who scored a couple of really cool Lambic glasses at the end of the night? THIS GUY! One last note about past events and I’ll tell you about some things coming up in the future. Last night (Wednesday 2/27/13) there was a Brooklyn Tap takeover at Suttree’s. I got to try the Brooklyn 25th Anniversary Lager. It is incredibly good and as far as we know, the only place in East TN to try it is at ol’ Sut’s. If you’re lucky, they might still have some on tap. It’s worth getting while you can. Josh, the local Brooklyn rep was there with free swag and pouring samples of Sorachi Ace, 2012 Black ops, and Local 1 and 2. I had a good time hanging out with the Suttree’s Crew, Jeremy and Nate from Eagle, Brooklyn Josh, my old buddy Booze Traveler and one of my assistant brewers, Richard. Also on Saturday at 2 pm it’s the next Knox Beer Crew tasting. This month’s get together is at The Casual Pint’s downtown location. If you plan on attending, please bring some beer and send an email to Matt Crowell with what you plan on bringing so he can add it to the list. I will see you there, for sure. Next Thursday March 7th Southern Tier Brewing Company will be taking over the taps at Suttree’s. From what I hear they are bringing out the rarities. 18 taps of Southern Tier goodness, oh hell yes! Knox Beer Week takes place this summer from June 22nd through the 29th. The KBW committee is meeting again Sunday and we are continuing to plan what looks to be an unforgettable week. We should be announcing the logo contest winner soon as well as releasing a preliminary schedule. Also, can we say Untappd badge anyone? The last thing to keep in mind is the upcoming Thirsty Orange Beer Festival taking place April 13th at the Mellow Mushroom in Johnson City. I poured my beers there last year and plan on doing the same this time. It was a great festival, really well done. Get your tickets and book your hotel now. With over 40 home brewers competing in the Iron Brewer challenge, this is not to be missed. This is all for now, I’ll be back to post again soon. 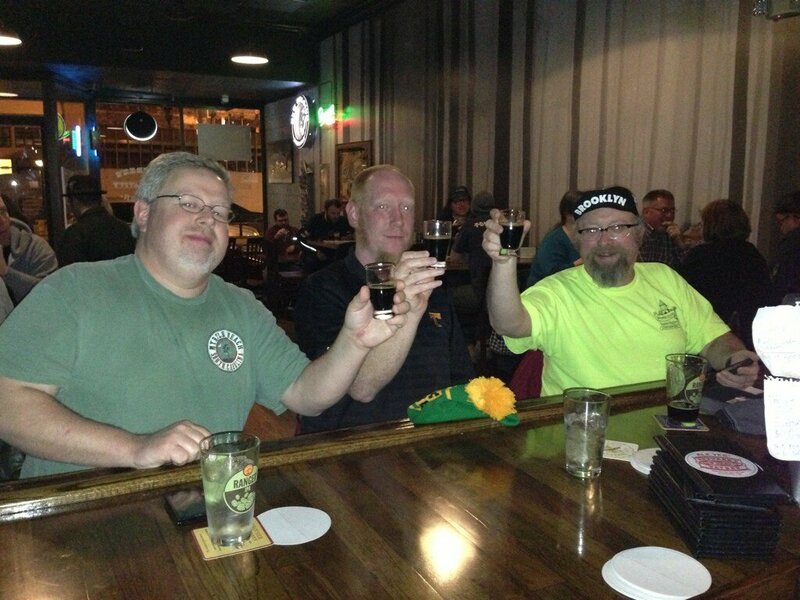 This entry was posted on Thursday, February 28th, 2013 at 17:11 and is filed under #knoxbeer. You can follow any responses to this entry through the RSS 2.0 feed. You can leave a response, or trackback from your own site.